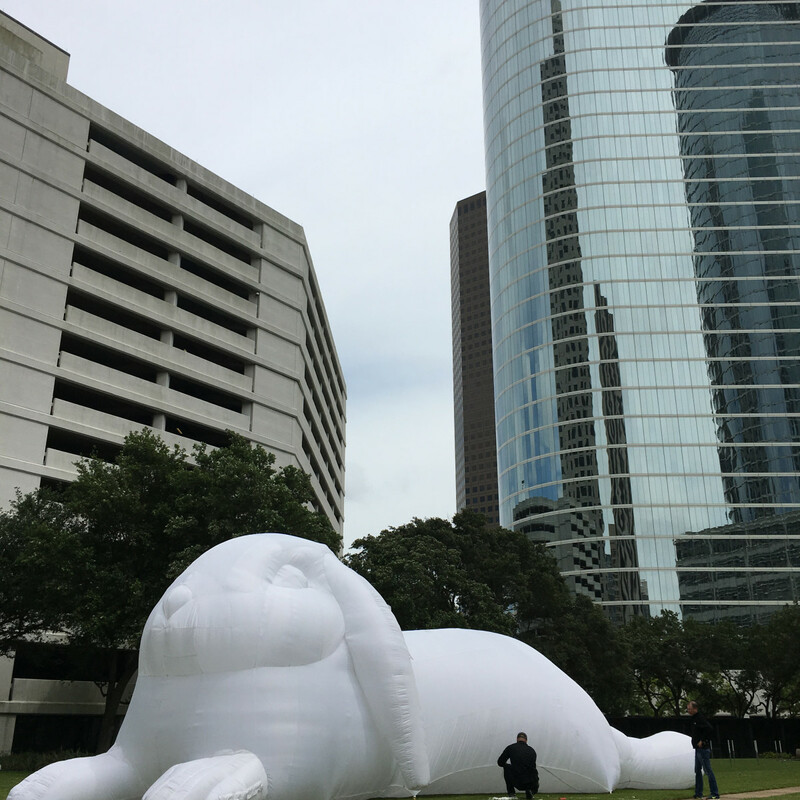 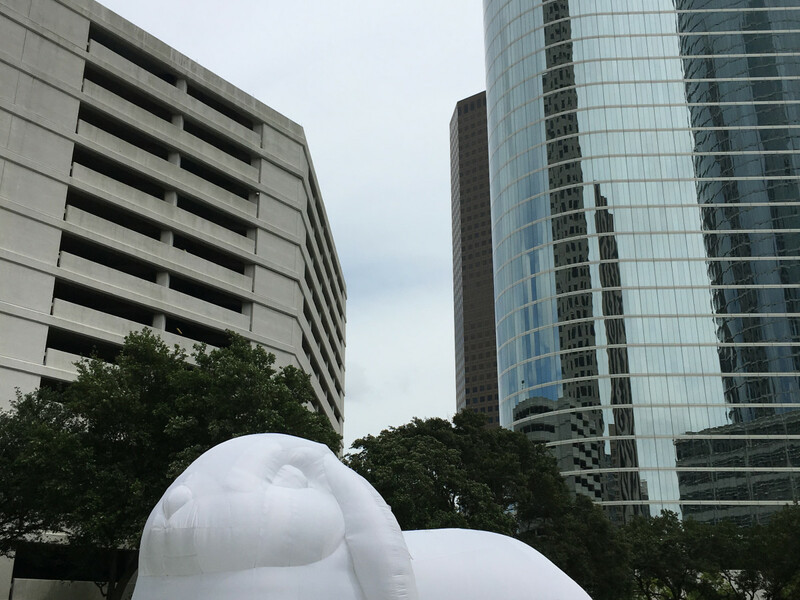 A dreary Monday morning turned sunnier in downtown Houston as an acclaimed public art installation by Australian artist Amanda Parer emerged on the lawn in front of the 1600 Smith Street skyscraper. 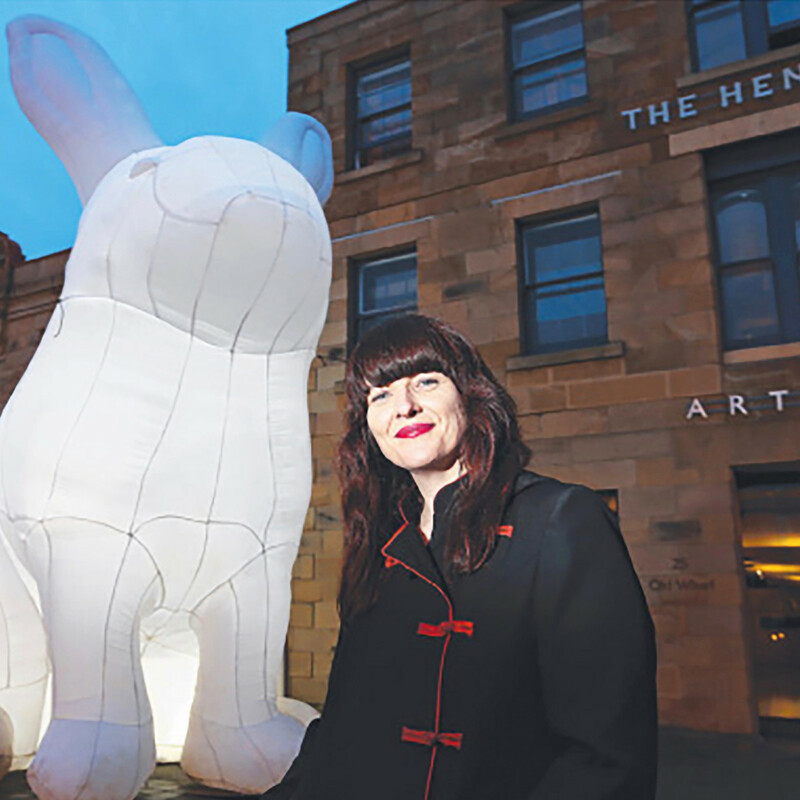 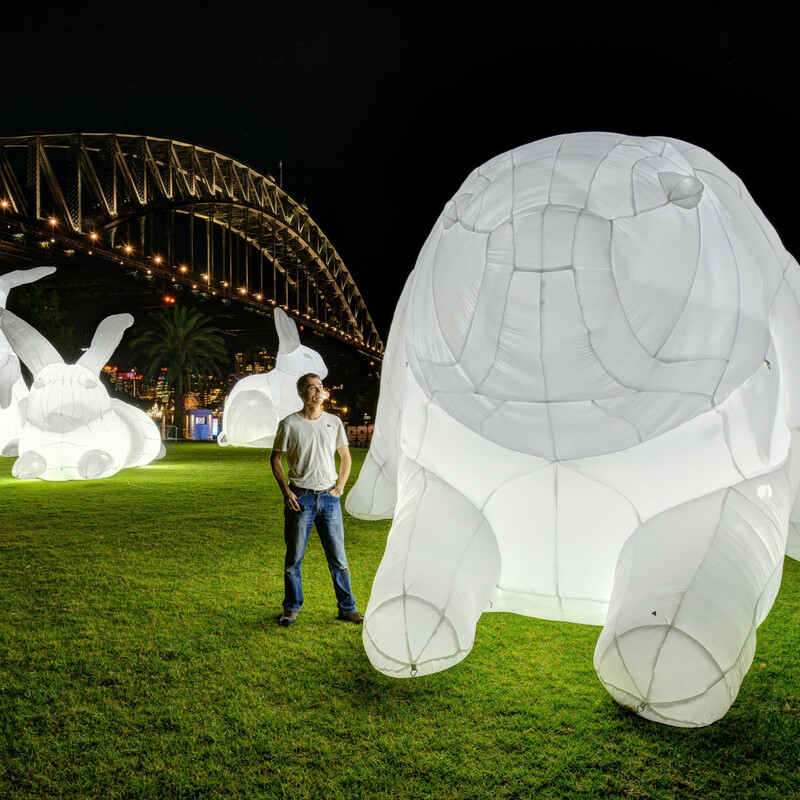 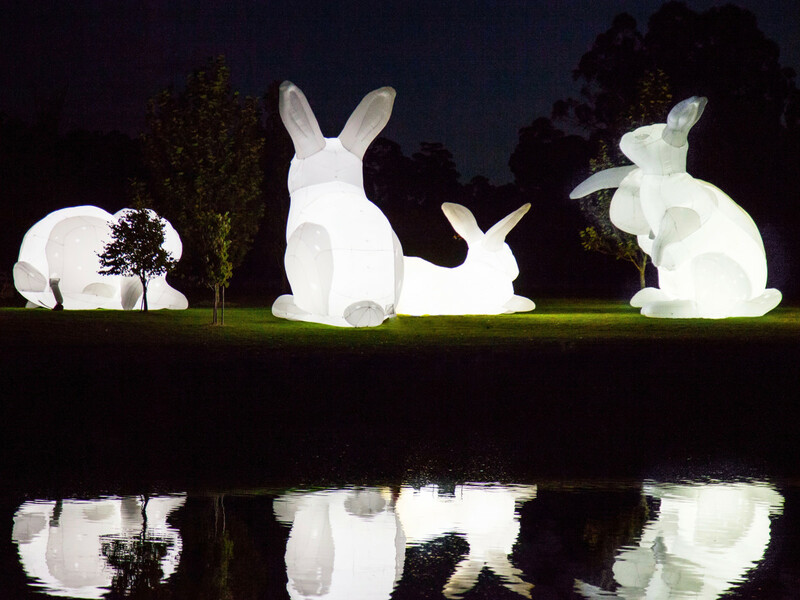 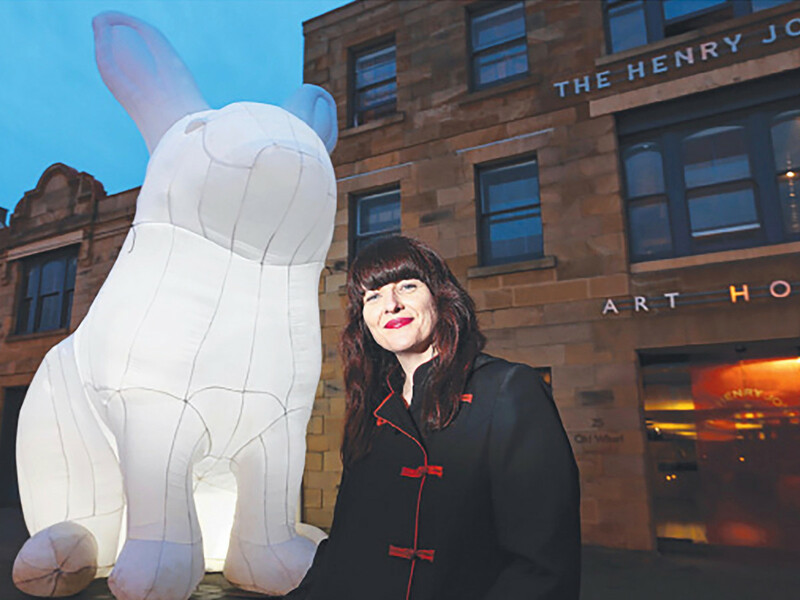 Titled Intrude, the installation features monumental sculptural rabbits, each sewn in white nylon, inflated and internally lit. 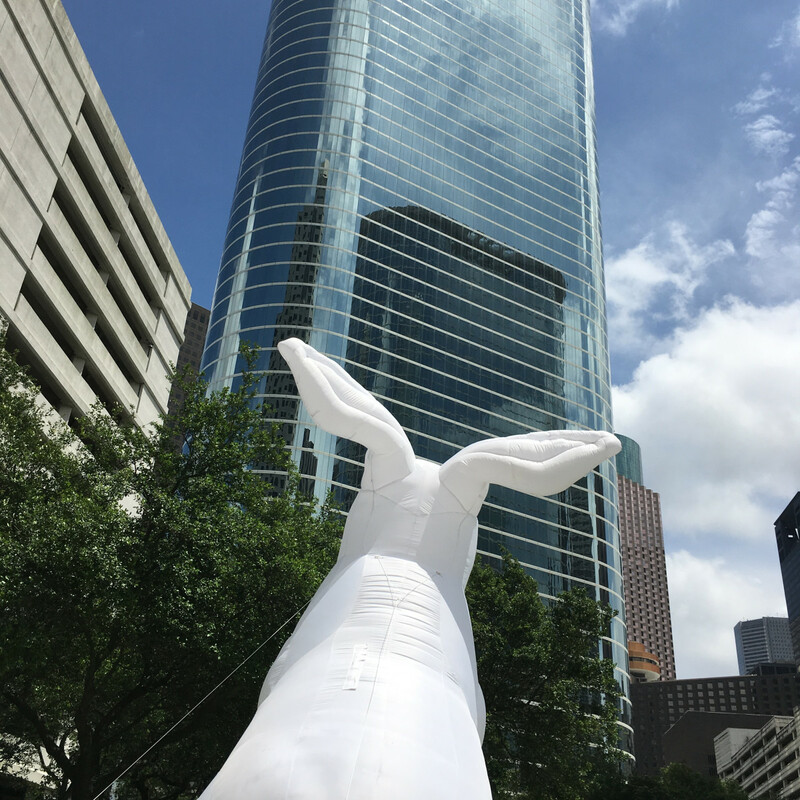 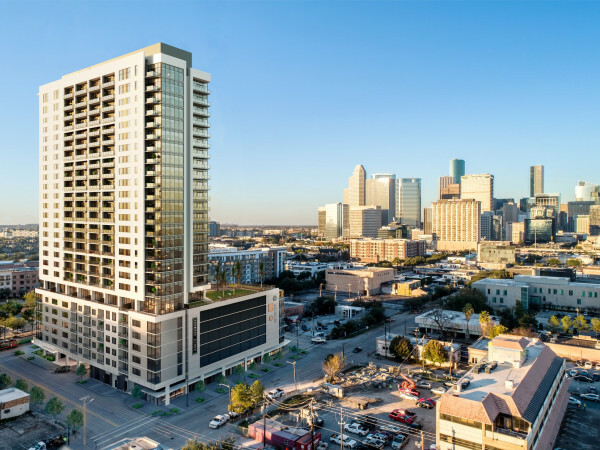 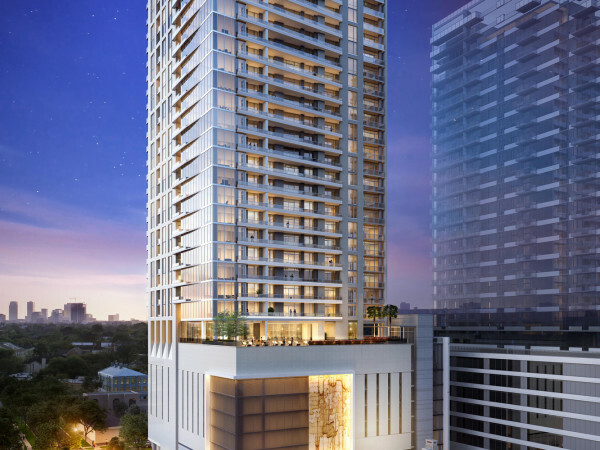 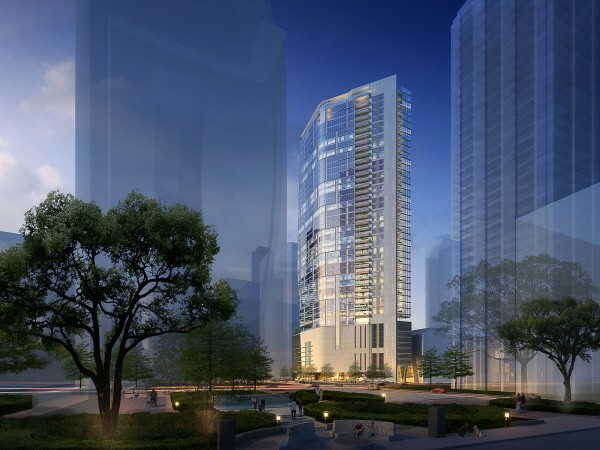 Once the Houston exhibit is completed, it will include five original bunny sculptures and two giant rabbits, each rising more than two-stories in height, which were commissioned by Arts Brookfield, the cultural arm of the global real estate corporation. 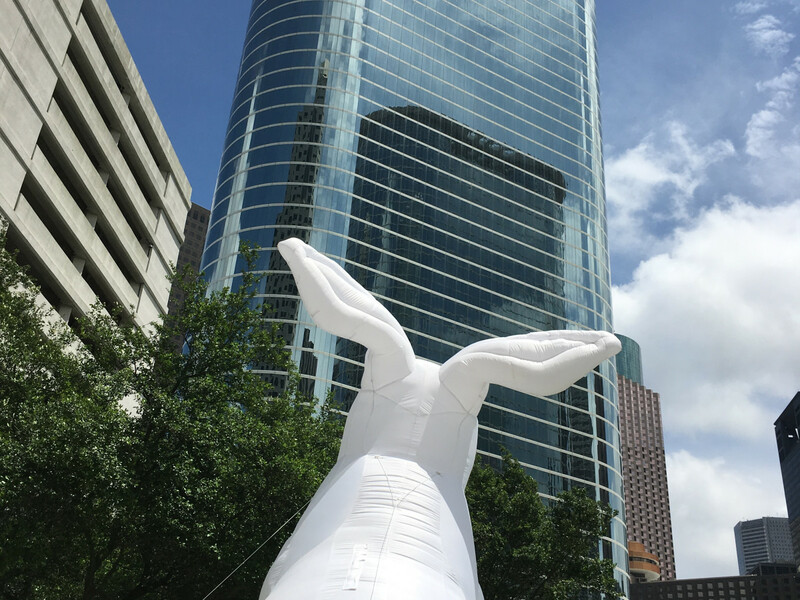 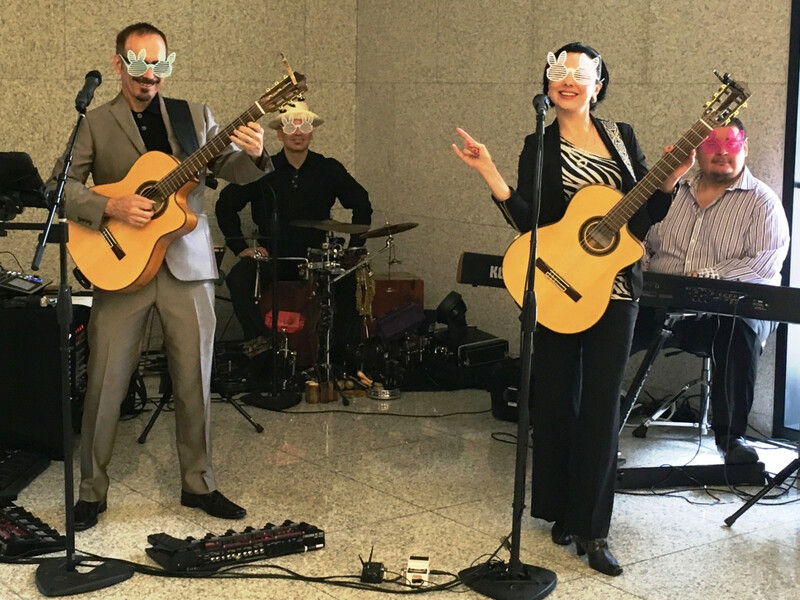 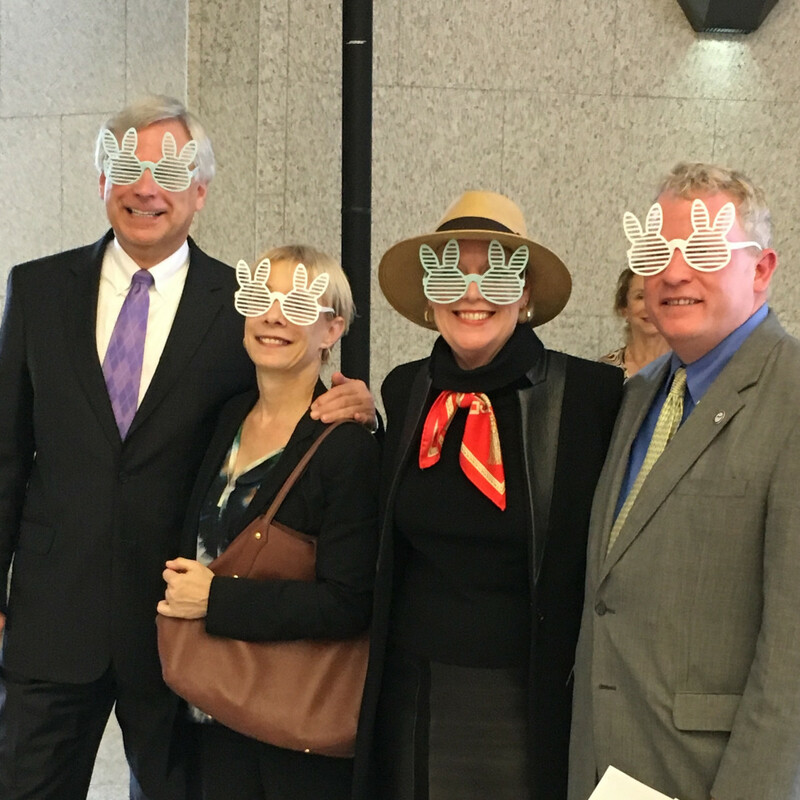 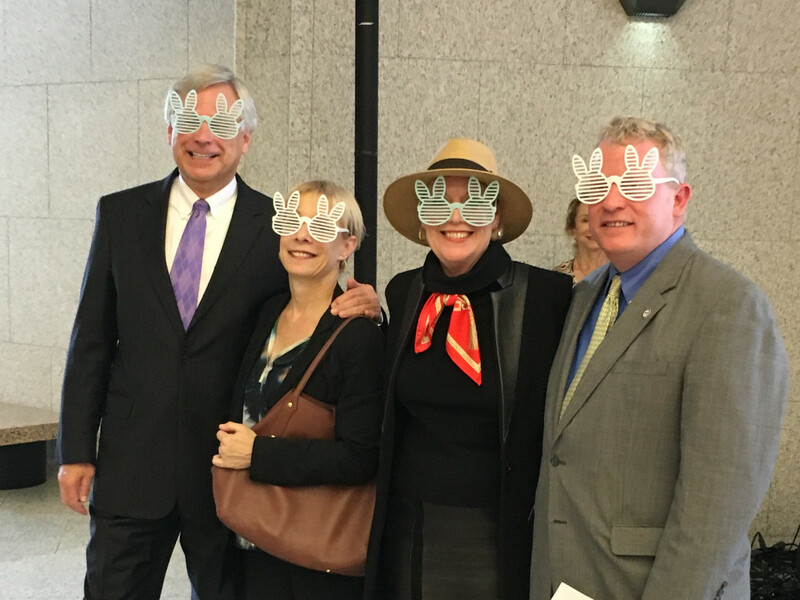 Due to heavy winds, only two bunnies could be inflated on Monday during a ceremony attended by such notables as Houston City Council member David W. Robinson, Arts Brookfield vice president and artistic director Debra Simon, Brookfield vp of operations Ted Zwieg, and Brookfield manager of arts and events Terri Diraddo — all wearing bunny glasses for the occasion. 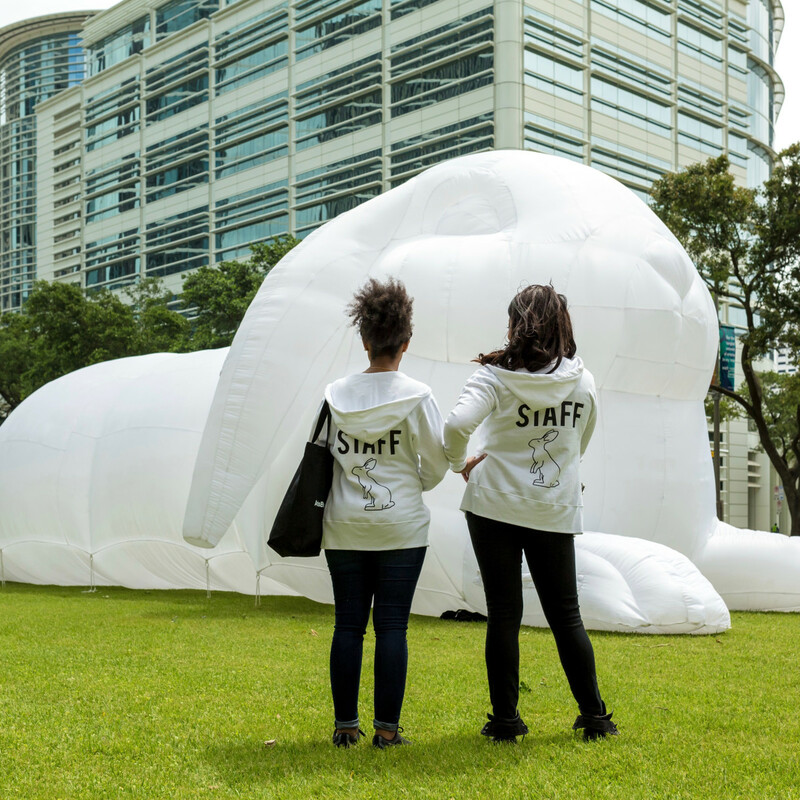 Organizers are hopeful the other rabbits can rise on Tuesday. 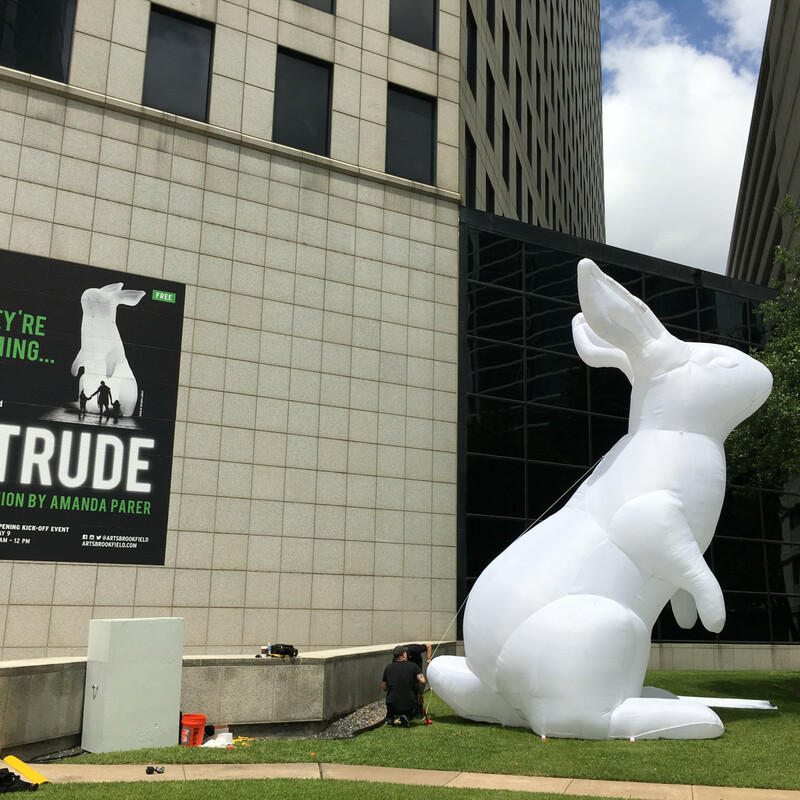 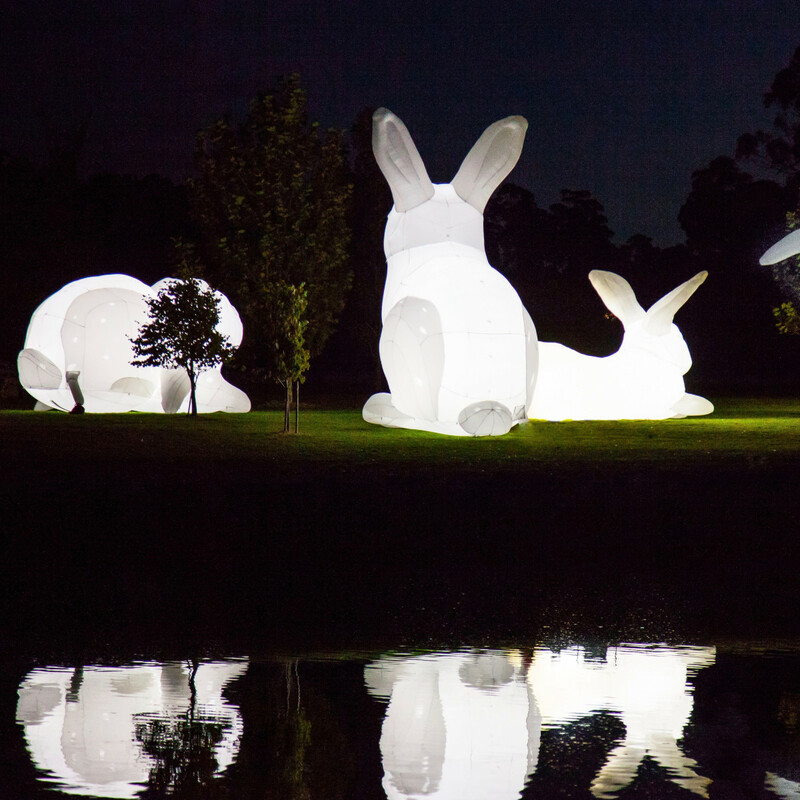 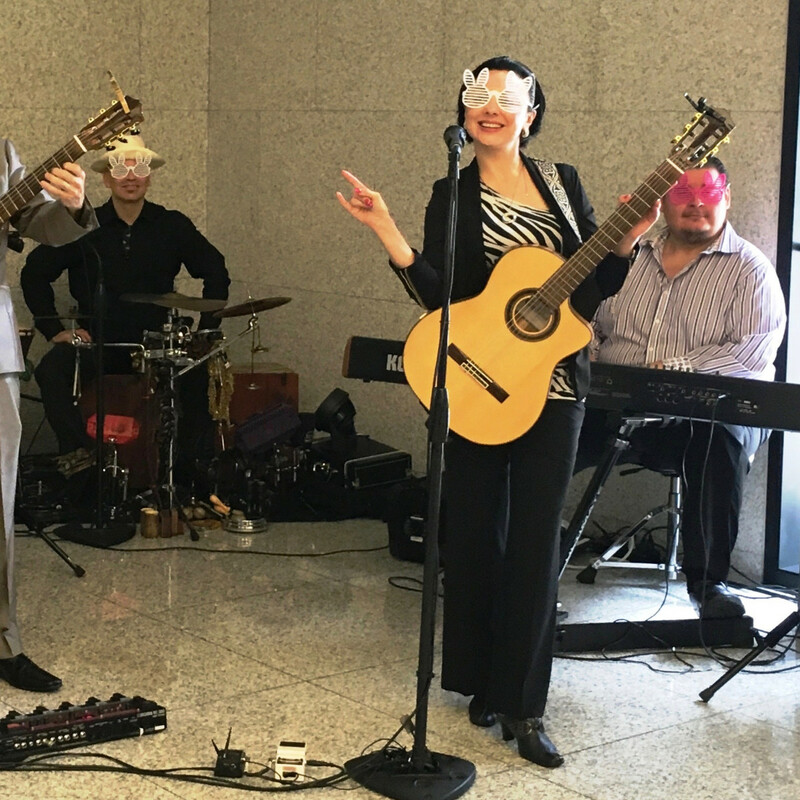 The bunnies, part of a four-city national tour and free exhibition, will be in Houston May 9-14. 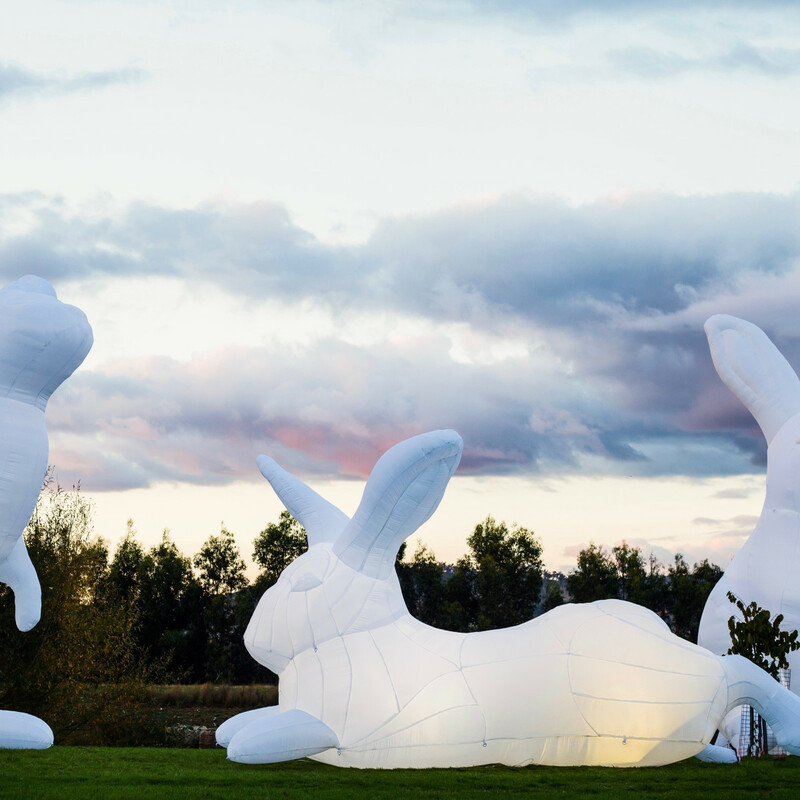 The bunnies will be inflated daily at 11 am and are on display until 9 pm during their stay. 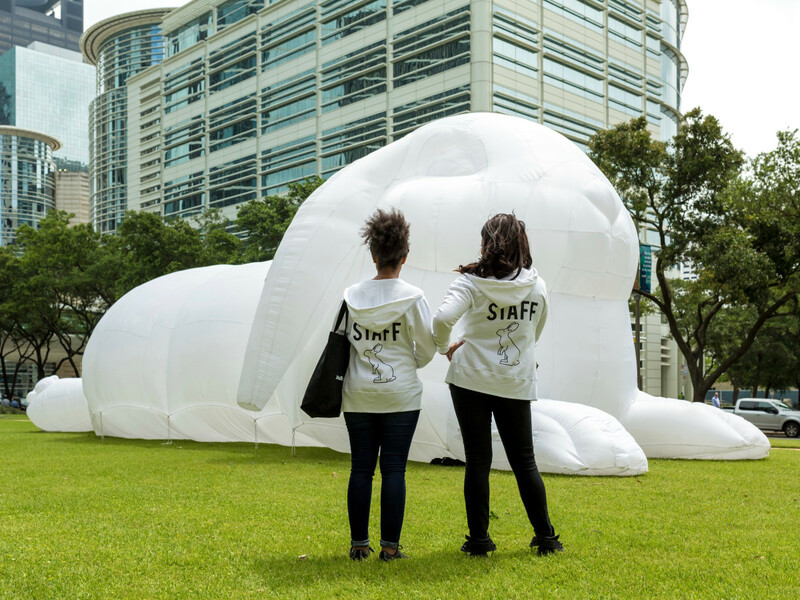 In the exhibit, Parer examines the duality of the large rabbits, which appear soft and cuddly, but in her native Australia are considered out-of-control pests that leave a trail of ecological destruction and defy all attempts at eradication. 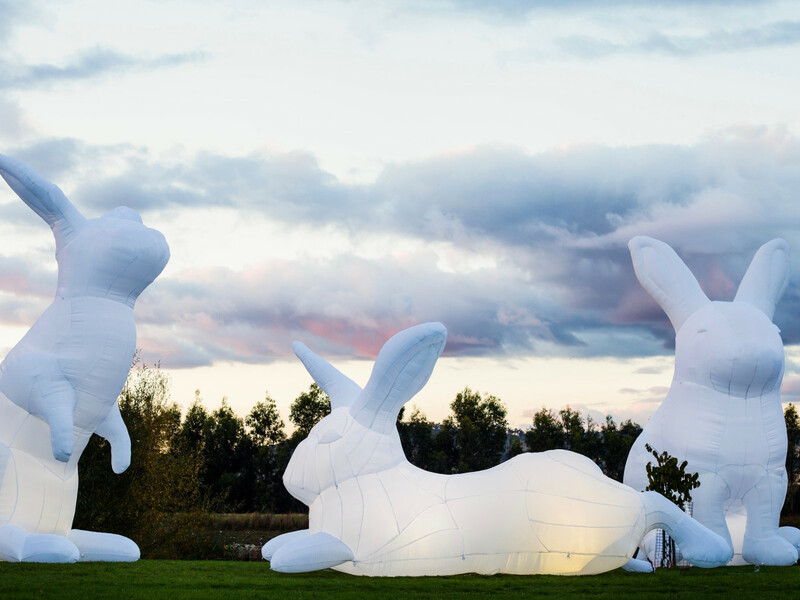 "They represent the fairytale animals from our childhood – a furry innocence, frolicking through idyllic fields," Parer says on her website. 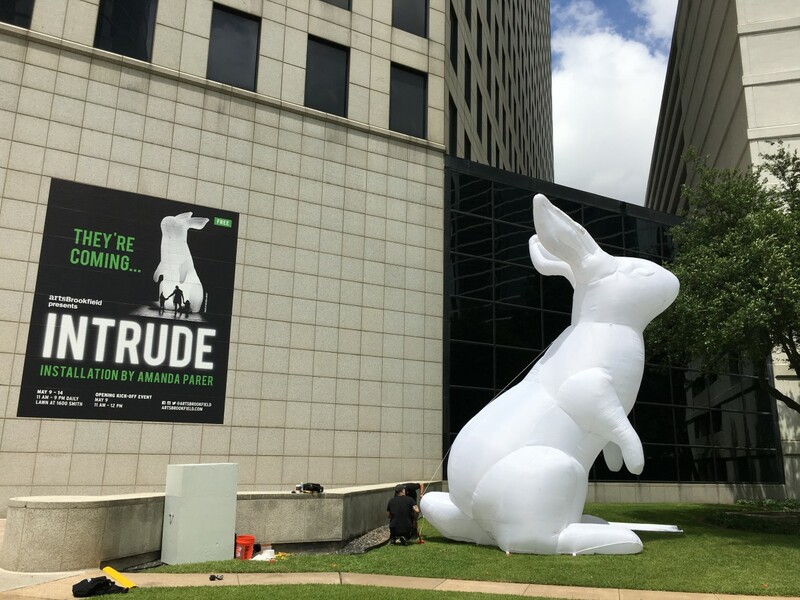 "Intrude deliberately evokes this cutesy image, and a strong visual humor, to lure you into the artwork only to reveal the more serious environmental messages in the work. 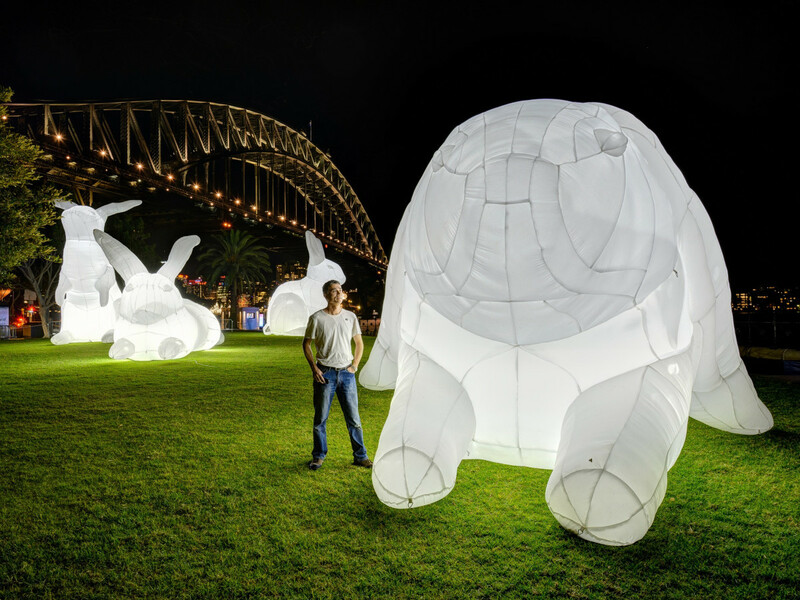 They are huge, the size referencing 'the elephant in the room,' the problem, like our environmental impact, big but easily ignored."